Enjoy a retirement party planned in your honor. Following some simple retirement party etiquette can ensure that hosts, guests and the honored retiree have a wonderful time at the soiree. 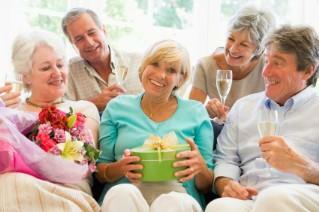 Retirement parties do not have too many etiquette rules that differ from other general parties. Minding your manners is never a faux pas, so keep some of the following tips in mind the next time you host or attend a party. The persons hosting a party should get party invitations out in a timely manner, several weeks before the event is scheduled. Ask the person retiring who she/he wants invited to the party. If the party is a surprise, enlist the help of a trusted friend or relative when making the guest list. Like other parties, do not ask guests to pay for their own dinners or drinks. Plan to have plenty of seating available, a few party ice breakers and enough food for everyone. The party can be a simple one, or you could come up with retirement party ideas with a theme, like travel, golfing, or even a luau. Guests who attend a retirement party should dress appropriately for the occasion. A casual backyard barbeque for friends and family begets informal attire, while a country club dinner means you should dress up. Avoid talking about problems at your own job or discussing any past issues the retiree had at his/her workplace. Keep the conversation flowing, but do not talk too much about yourself. If you are a coworker of the retiree, do not angle for his/her job at the party. While it is acceptable to have a few good party drinks, do not become inebriated. Have a good time without getting out of control. Avoid burning bridges with coworkers and bosses. Be gracious to everyone who attends, even if it is a coworker or neighbor who you do not generally socialize with. Offer a short speech thanking the company for the opportunity to work for them and in appreciation of everyone who attended in your honor. Accept any retirement gifts given to you with a gracious thank you in person and follow up with a written note several days later. Remember to thank the hosts of the party for their hard work in putting the party together. Corporations often host retirement parties for employees. These parties might range from a casual office gathering with cake for a group of people retiring to a department hosting a small dinner for a single person retiring to a formal dinner and dancing extravaganza in honor of the retiree. Formal corporate retirement parties might require you make a retirement dinner speech-it may not be optional. If you are planning a small office party, invite everyone from the department or office, even if you do not particularly care for someone. This is not the time to single out one or two people in an office of ten. Some formal corporate events might require a payment for dinner for additional guests beyond those the company is covering. Casual office retirement parties may not be suitable for inviting lots of friends and family; ask the party planner first. Avoid bringing children to an office retirement party. If you are sharing the retirement party with other retirees from the company, do not dominate conversations or have a long speech; allow everyone to share in the spotlight. Like any retirement party, the retiree and guests should avoid any trash talking about the company, coworkers or the boss at a corporate retirement party. This is a time to celebrate accomplishments, not bring up problems.